I used to run a country Bed & Breakfast just outside of beautiful Ashland, Oregon. 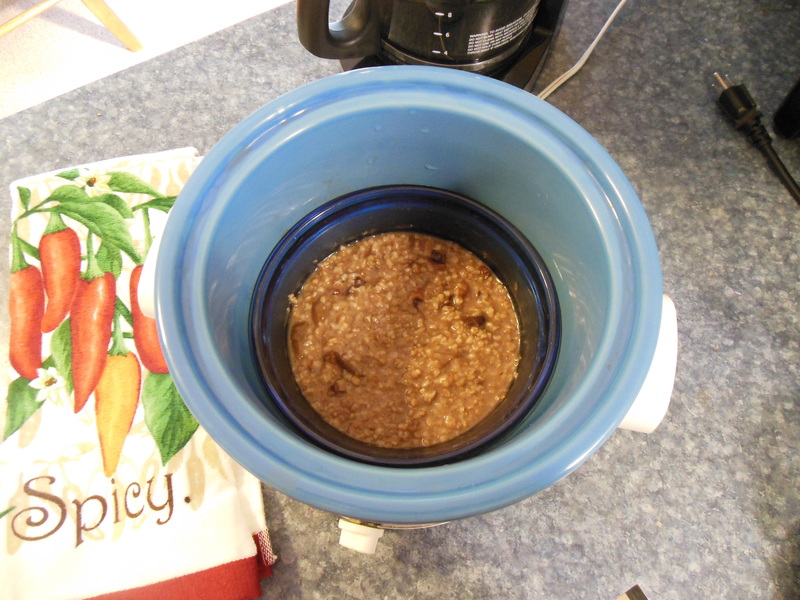 That seems like a lifetime ago, but I remember that one of my guests’ favorite breakfasts was actually one of my most simple – but delicious recipes – Steel Cut Oatmeal in an overnight water bath. It was, and still is, one of my favorite go-to breakfasts as well. With just a few minutes of preparation the night before, you can awaken to some steamy, creamy perfectly prepared oatmeal every time and feel like you’re being pampered at a bed and breakfast every morning. 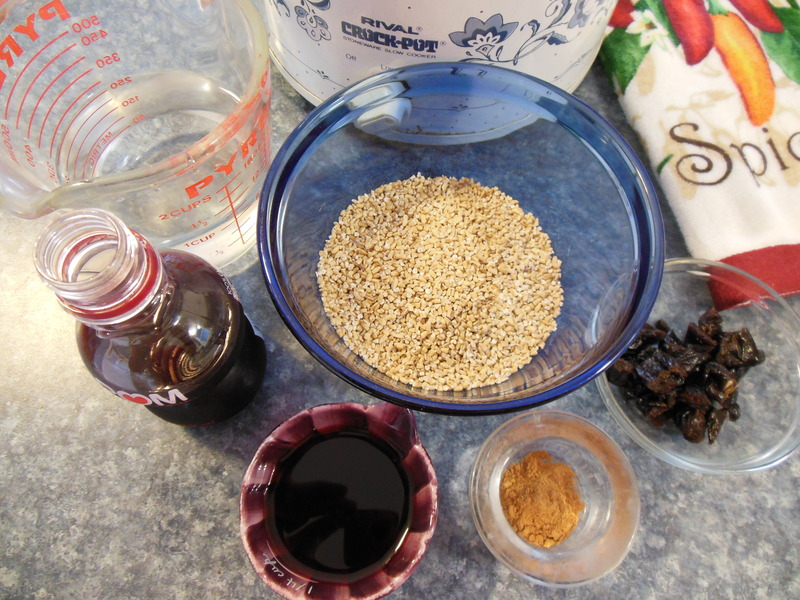 You can buy steel cut oats in bulk or purchase packaged well-known brands from any grocery store; and when they are cooked on the stove-top, steel cut oats can take up to 30 minutes. On a busy weekday morning, that’s a lot of precious time to be standing over a hot stove. However, when you use your slow cooker like a double-boiler, by placing the ingredients into it’s own bowl then into the pot, the night before, it will take away that early morning chore and the clean up will be so much easier because the cereal won’t be cooked in the slow cooker crockery where it can get all crusty on the sides (and sometimes a bit burnt.) There’s no lost oats, no soaking, no scrubbing. In this photo, I cooked a single serving and used my smaller slow cooker. When I cook up 4 servings, I use a larger inside bowl and place it inside my 7-quart slow cooker. Find an oven-safe bowl that holds your ingredients and fits inside your slow cooker with the lid on – with a bit of space between the edge of the bowl and the slow cooker. Measure out your oats and pour into the inner bowl. Add your choice of liquid, any desired fruit, and ½ tsp cinnamon for each cup of oats; stir until blended, Fill the slow cooker with a few inches of water so that when you place the inner bowl into the cooker it rises up around the bowl but does not spill into the cereal mixture. Place the lid. Set the cooker to low. Off to bed. When you awaken the next morning, your oats will be cooked to perfection. For this batch, I used 1/2 cup steel cut oats, 1/4 cup pomegranate juice, 1-1/4 cups water, 1/2 tsp cinnamon and 5 dried plums, chopped. 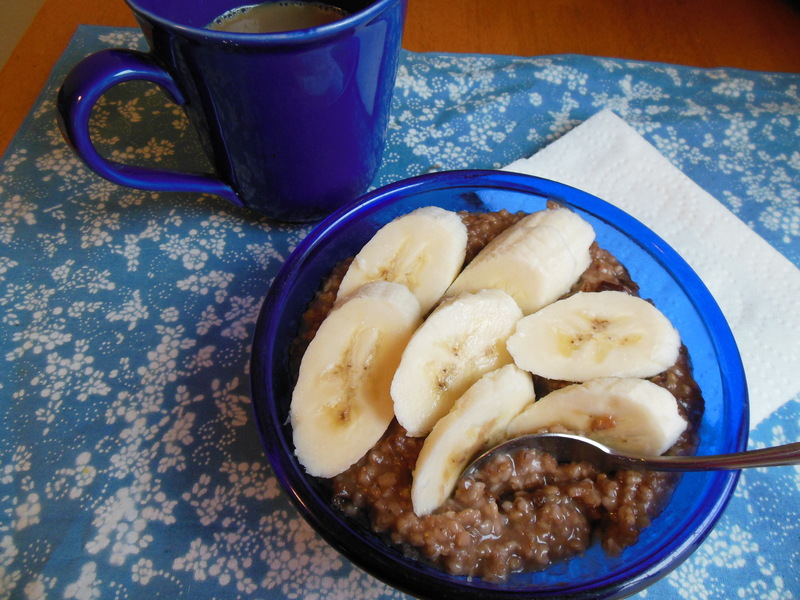 For one serving: Use 1/2-cup steel cut oats with 1-1/2 cups liquid. 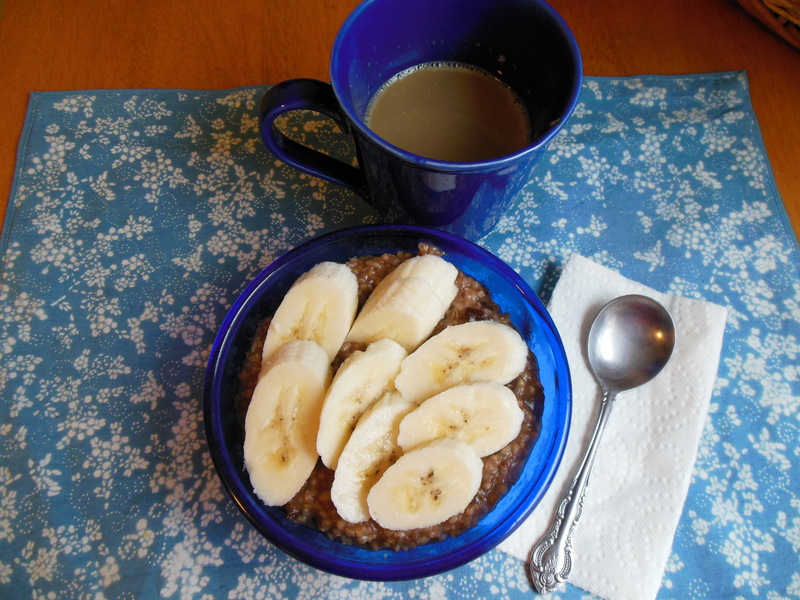 For 4 servings use 1-cup steel cut oats with 3 cups liquid. There are so many variations for you to explore with the simple recipe.